The GCB’s annual Golf Day raised more than £4000 to support cricket in schools. Cheltenham’s Aled Howell also scooped the individual honours with Bola’s Ollie Ralph finishing as runner-up. Bishopston CC came second in the team standings but didn’t go home empty-handed after winning the yellow ball competition. 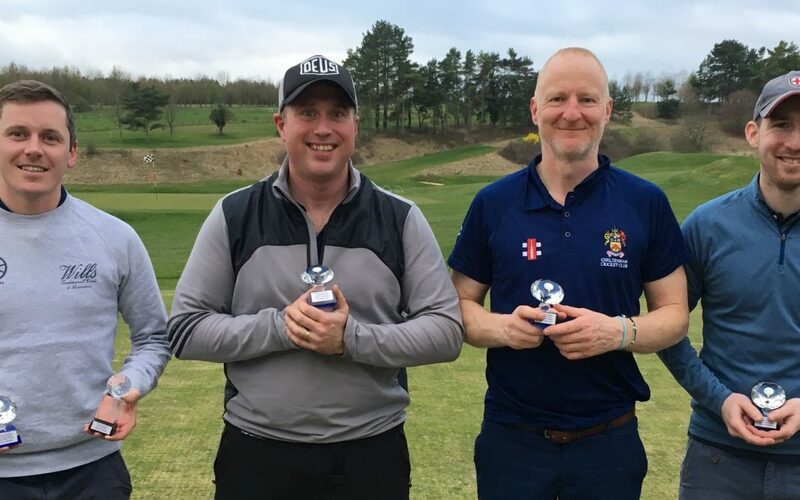 In addition to the team and individual competitions there were also two prizes for closest to the pin and both a longest and straightest drive contest. Frocester CC’s Ash Davis and Mark Burland of First Class Comms were victorious in the closest to the pin challenges. Steve Phillips (St Austell Brewery) won the straightest drive while Matt Jackson (Jelf Insurance) recorded the longest drive of the day. Current Gloucestershire player Harry Hankins took part as well as ex-professionals David Partridge and Tim Hancock. In addition to the golf there was a raffle and auction featuring an array of fabulous prizes donated by the Board’s partners and supporters including Gloucestershire Cricket, St Austell Brewery, World Snooker and Gray Nicolls.